How does Sleep Apnea Affect the Heart? | Advanced Sleep Medicine Services, Inc.
Advanced Sleep Medicine Services, Inc.
How does Sleep Apnea Affect the Heart? Sleep apnea can be frightening for the people who experience it as well as their partners, who watch as their slumbering companions suddenly stop breathing, choke and wake, sometimes dozens of times an hour. The worry is well-founded, because sleep apnea is more than a disturbance at night. Studies have shown that obstructive sleep apnea increases the risk of cardiovascular disease, hypertension and even death due to cardiac arrest. Sleep apnea can come in two forms. Central sleep apnea, the rarer form, happens when signals from the brain that instruct the breath are interrupted during sleep. The more common form is obstructive sleep apnea, where soft tissues constrict the airway and it collapses during sleep. 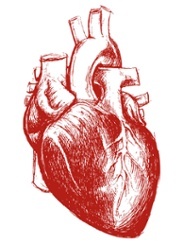 The first evidence of a connection between heart health and sleep apnea is how often cardiovascular disease and sleep disturbance shows up in the same individuals. One study found that 50 percent or more of cardiovascular patients have sleep apnea, compared to less than 5 percent in the overall population ^1. Another study determined that patients with both heart failure and sleep apnea died at twice the rate of those with just heart failure ^2. Further evidence of the connection comes from the fact that central sleep apnea, while rare in the general population, commonly occurs in patients with heart failure ^3. Sudden cardiac death is also more likely to strike sleep apnea sufferers during their sleeping hours, exactly the time of day when sudden cardiac death is least likely to hit people without sleep apnea ^4. A study of 1,522 people recruited for the Wisconsin Sleep Study found that particpants were three times more likely to die in the 18 year period if their inital sleep study (called polysomnography, or PSG) showed that they had sleep disordered breathing (a wide range of sleep-related breathing abnormalities including snoring and obstructive sleep apnea), versus those that didn’t ^5. The leading causes of death in those people were stroke and cardiovascular disease. But the cardiovascular association grew clear after a closer look: People with untreated severe cases of sleep apnea were five times more likely to die of cardiovascular-related causes. Another study stands out because it involved so many participants. Researchers looked through the medical records of 10,701 adults who had sleep studies at the Mayo Clinic Sleep Disorder Center in Minnesota. They found that the risk of sudden cardiac death was significantly higher in people who were prescribed continuous positive airway, or CPAP, therapy but didn’t use the device in the 5 to 15 years after their sleep assessment. The researchers determined that if sleep apnea pushed the blood oxygen concentration to as low as 78 percent on average during the night, the risk of sudden cardiac death doubled ^6. Notably, the team also found that the severity of sleep apnea increased the risk of sudden cardiac death. “Generally the worse the apnea, the greater the risk,” says Virend Somers, M.D., who directs the Cardiovascular Facility and the Sleep Facility within Mayo Clinic’s Center for Clinical and Translational Science and was senior author on that study. Why Does Sleep Apnea Affect the Heart? Yet, researchers have yet to fully understand exactly how sleep apnea could lead to troubles with heart health. The sleep disorder is also strongly associated with obesity, stroke and type II diabetes, all health troubles that can play into the development and worsening of cardiovascular problems. However, the studies are stacking up. 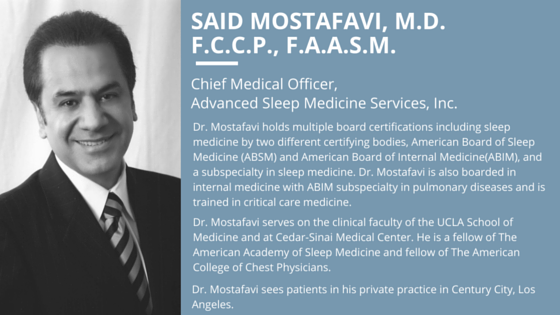 “Even if you separate out the other risk factors—stress, metabolic syndrome—sleep apnea is still an independent risk factor for cardiovascular problems,” says Mostafavi. 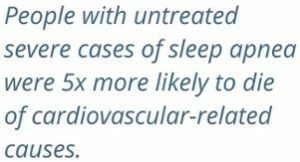 A joint scientific statement from the American Heart Association and the American College of Cardiology outlines some of the biological reasons that could explain sleep apnea’s influence on cardiovascular disease and death, even when those other conditions are taken into account ^7. In a typical, non-disordered night’s sleep, a person’s blood pressure, heart rate and respiration dip and climb as they enter and leave different stages of sleep. But in sleep apnea, those changes are more dramatic and tied to the duration of apnea episodes instead of sleep’s natural rhythms. This disruption of the sleep cycle sets off a host of changes throughout the body ^8. A person with sleep apnea’s blood oxygen levels can drop to less than 60 percent. Normally these levels are at 95 to 100 percent. This hypoxemia triggers a number of changes. Blood vessels constrict and increase blood pressure, causing spikes that can reach 240/130. Sleep apnea also pushes the sympathetic nervous system into a more active state. As a result, people with sleep apnea have higher heart rates even when awake. They also have more variable blood pressure and a less variable heart rate, two conditions that have been associated with poorer heart health in the Framingham Heart Study. “Often not recognized is that sleep apnea can cause severe slowing of the heart and sometimes asystole that may also lead to cardiac arrest,” says Virend. Sleep apnea’s stresses can also trigger a cascade of other events that lead to inflammation, insulin resistance and other system-wide effects. In a recent study, Susan Redline, M.D., a senior physician at Brigham and Women’s Hospital and the Peter C. Farrell Professor of Sleep Medicine at Harvard Medical School, and her colleagues found that even early in the development of sleep apnea, women have increased levels of a protein called Troponin T. This protein is released into the blood when the heart muscle is damaged. Although men are more likely to develop sleep apnea in the first place, her team found that older women have a higher risk of developing sleep apnea-related heart disease than older men do ^9. “This study turns on its head the notion that sleep apnea is a ‘man’s’ disease,” she says. She also warns that women with sleep apnea may not have the snoring or daytime sleepiness that men do, instead reporting issues with sleep quality and fatigue. 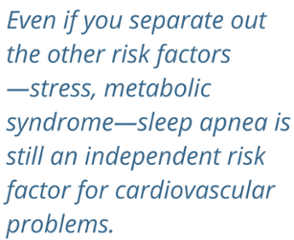 The joint statement notes that there is still plenty of areas to be researched to better understand the biology at play, but sleep apnea’s risks are enough that physicians should act to identify sleep apnea in their patients; both men and women. Fortunately, there is a solution. “Treatment of sleep apnea earlier in life can prevent this cascade,” and halt the “series of insults that lead to heart failure and death,” says Redline. A research team based in Ireland followed 168 patients over several years after they started continuous positive airway pressure (CPAP) therapy. The team found that the development of new cases of heart disease reached 14 percent in the group of people who did not use CPAP, compared to 5 percent in a group that did ^10. The fact that the treatment saves lives also strengthens researchers’ certainty that there is a connection between cardiac-related problems and sleep apnea. Another research group, this time in Spain, also followed up after an initial sleep study to see if CPAP made a difference in the participants’ survival. Every year for over a decade, the team checked in on 264 healthy men, 377 male snorers, 403 men with untreated mild-to-moderate obstructive sleep apnea, 235 with untreated severe sleep apnea and 372 men with sleep apnea who used CPAP. After 12 years, the group of men with untreated severe sleep apnea had the worst outlook. More than a third had experienced a non-fatal cardiovascular event such as a heart attack, and about 17 percent had a fatal event (see the graphs to the right). 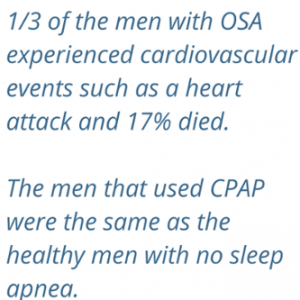 In contrast, the men who used CPAP experienced such events only at about the same rate as the healthy men ^11. Researchers suspect that the relief of the sleep-related breathing disturbance from using CPAP allows the body to repair the damage that has been caused. The changes in blood vessel walls and metabolism take years to evolve, so researchers also expect that it takes time for the benefits of CPAP therapy to make their mark as well. 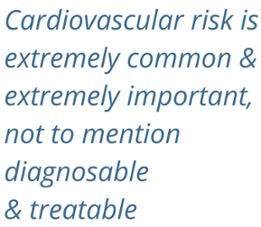 Of course, treatment of sleep apnea alone is not the only protection people should have against cardiovascular disease. Exercise and diet are still important in keeping hearts healthy. About one in five adults in the U.S. has at least mild sleep apnea and 1 in 15 have a moderate or severe case. Experts estimate that more than 85 percent of people with sleep apnea haven’t actually been diagnosed. That means that thousands of people are walking around, unaware of the risk their undiagnosed condition is placing on their heart. Marin, J.M., et al., (2005). 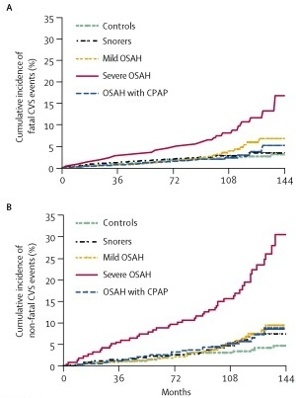 Long-term cardiovascular outcomes in men with obstructive sleep apnoea-hypopnoea with or without treatment with continuous positive airway pressure: an observational study. Lancet, 365(9464), 1046-1053. PubMed. How Does Sleep Apnea Impact the Brain? With more than 20 locations across California, Advanced Sleep Medicine Services, Inc. is a leading provider of in-center and in-home (HST) sleep studies, PAP therapeutic devices and replacement PAP supplies. © Advanced Sleep Medicine Services, Inc. 2019 © ResMed 2019. Used with permission. Subscribe To The Sleep Blog!